For over the past 15 years Ace has been leading thousands of guests down the amazing Ocoee River. We are the only licensed funyak outfitter on the Ocoee, and we offer one of the most personal and extreme whitewater trips commercially available. Your day begins with a flat-water warm-up where you will work alongside professional kayakers to improve upon and better your understanding of paddling form, technique, and theory. After this, your adventure then culminates with five miles of some of the best whitewater in the country. Take it from us that there is nothing like the rush of running a rapid by yourself. The word satisfaction only begins to describe the feeling of accomplishment left when you have successfully navigated a tough piece of whitewater. This is what we do with our lives. This is our love and we want to share it with you. Ace can take you beyond the thrill of whitewater rafting. If you’ve wondered what it would be like to paddle your own kayak, here is your opportunity. Ace Ocoee funyaking trips are geared toward the enthusiastic whitewater novice. People who have limited whitewater experience but are anxious to sample the thrill of kayaking are perfect. We provide everything you need. Although no experience is required, this is a rigorous full-day activity. All participants must be in reasonably good condition and be at least 12 years old. A funyak, or ducky, is an inflatable kayak. Funyaks are shaped like kayaks, have similar dimensions, and move down the river in much of the same way. The main differences are that they are more stable and you are not enclosed inside. What does this mean? On the water they are more forgiving, and if you flip you will not have to roll back up! 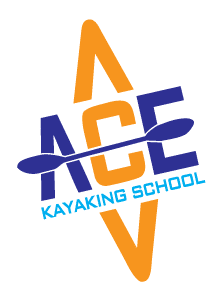 Ace is geared toward the enthusiastic whitewater novice. 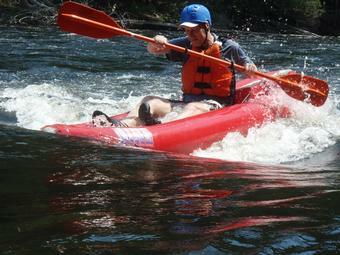 People who have limited whitewater experience but are anxious to sample the thrill of kayaking are perfect. We provide everything you need. Although no experience is required, this is a rigorous full-day activity. All participants must be in reasonably good condition and be at least 12 years old (For Ocoee Trips). Ace Funyaks maintains an impeccable safety record. Our trips are guided by qualified personnel who have met the state’s first aid and safety regulations and carry first aid supplies. All guests are required to wear a life jacket, helmet, and wet suit. The wet suits may seem overkill, but if you end up out of your boat there’s nothing like a layer of neoprene for protection. Our customer to instructor ratio puts us a level above. Our trips always have at least one guide for every three guests. With this ratio it is possible to maintain close contact with you at all times, and there is no substitute for that. In all whitewater activities there are inherent dangers. Please refer to our waiver for more information. Can I rent a funyak?